It is a necessary apparatus for scientific researches, being applicable to storage of strains and culture of organisms in the fields of medical treatment, public health, pharmaceuticals, biology and agricultural science. 1..Inligent temperature controller is based microprocessor with PID parameters controlling function .Digital display of set and actual temperatures. High temperature controlling accuracy and reliability. 2. 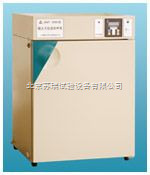 There is a layer of toughtoned-glass door with sealing rubber as the inner lay of the outer door for convenient observation of the in-incubator conditions during is without affecting in-incubator temperature . 3. The working chamber use mirror stainless steel and the arc roundish are easy to clean. Characteristic: Water-jacket heating mode. Temperature is even in the working chamber. if power failure, the chamber can keep constant temperature for longer.